The Guyana government is said to be gravely concerned about the alleged assault of a Guyanese gold concession ranger by a Russian and the matter could very well reach Cabinet, according to well-placed sources. 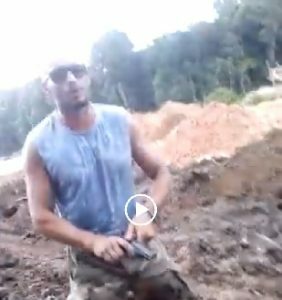 Interior Divisional Police Commander, Superintendent Kevin Adonis confirmed receiving a report from Ranger, Ken Edwards alleging that he was performing duties last Friday at about 10 AM, a Russian employee of West Demerara Gold Inc. assaulted him and took out his gun. He said a team of investigators would be returning to the area with Edwards who works with Sean Hopkinson’s Mining. It was not immediately clear whether any of the Russians have been permitted to bear firearms such as the pistol that was seen in the waist and hand of one of them during the altercation. Meanwhile, sources indicate that Minister of Natural Resources Raphael Trotman has asked the Commissioner of the Guyana Geology and Mines Commission, Newell Dennison to provide information as part of a briefing for next Tuesday’s Cabinet meeting. Demerara Waves Online News was told that the Corps of Natural Resource Wardens are expected to join the probe. Hopkinson told Demerara Waves Online News that the Russians were not permitted to be on his concession, but have been seen there collecting percentages resulting in huge losses to his company. 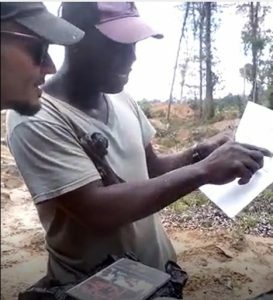 Ranger, Ken Edwards showing the Russian man documentation before the assault and gun-pulling incident. He said the Russians have exploratory rights on another concession that is adjacent to his, but instead they have been moving about the area freely conducting impermissible activities. “The Russians are just going and claim everything as all the land is theirs because that is what caused the problem when he showed him the GPS coordinates and the documentation,” Hopkinson said. A mining concession near Hopkinson’s land is the subject of High Court dispute.